Nice plant outside Karibib, Namibia. Synonyms: Anacampseros dinteri, Hans Schinz 1908. Anacampseros quinaria var. schmidtii Berger. Anacampseros schmidtii Poelln. Anacampseros wischkonii, Poelln. 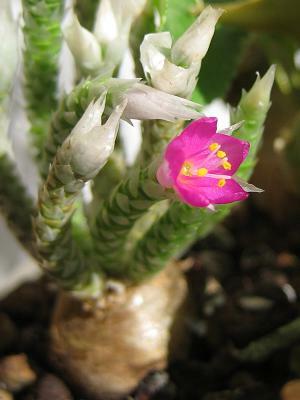 Anacampseros ombonensis, Poelln. Just an hour or so in the afternoon. 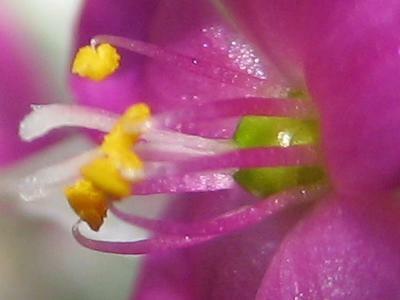 This little member of the Portulaceae family was given this name by Gordon Douglas Rowley in 1994. It is found in the central Namibia, growing in grit or other well drained soil with little water and lots of sun. The caudex can grow to two centimetres, the branches up to six centimetres. The flowers are white with a slight touch of pink.